I have been using Evernote since 2012; loved it so much that I upgraded to Evernote Business in April 2015. 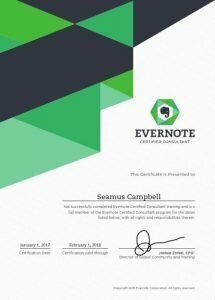 I started helping people with Evernote early 2015, have now completed the Evernote Certified Consultant course and am an official Evernote Certified Consultant. Maximize your workflow with guidance from an expert. Evernote Certified Consultants (ECCs) are recognized professionals with comprehensive Evernote training. Their hands-on guidance can help you and your team work more effectively and productively.